Last weeks the most disturbing science news headline was “How the city hurts your brain” circulating as new research that proves the evil of cities. The original article can be found at the Boston Globe. It all starts with a very innocent introduction where the author says: “The City has always been an engine of intellectual life, from the 18th-century coffeehouses of London, where citizens gathered to discuss chemistry and radical politics, to the Left Bank bars of modern Paris, where Pablo Picasso held forth on modern art. Without the metropolis, we might not have had the great art of Shakespeare or James Joyce; even Einstein was inspired by commuter trains.” From this point it goes down hill. From spreading cholera to the argument that the before named artists eventually moved out of the city, concluding “ … [the city] it’s also a deeply unnatural and overwhelming place” We’ll that is a statement, DEEPLY UNNATURAL! However, as we try to grasp the extend of the devastating news, the authors are quick with analysis and of course solution. It is all down to the city affecting the brain and a few minutes on the busy street will blow your memory and you start suffering from reduced self control (what does that mean?). Again with a very pointy argument, “that’s why Picasso left Paris”. The excuse comes in the form of the acceptance that “The mind is a limited machine” while still concluding this, the first solution comes in the form of “One of the main forces at work is a stark lack of nature”. I am aware that this is not actually a solution , but rather an other analysis or hypothesis, but in its tone directly implies to be a solution. And it does not stop there it straight goes through the wall with the sledge hammer solving ALL! the problems: “…that hospital patients recover more quickly when they can see trees from their windows, and that women living in public housing are better able to focus when their apartment overlooks a grassy courtyard”. WOW, now I feel much better and I am convinced we live in a better world. I think I stop here, because the article goes on for another four pages, I hope I have missed the point of the article and if some of you read it all through, please let me know what I missed. The ‘leave a comment’ field can be found at the end of the post. it might be much more complex, but we’ll keep things simple her for today.) To come back to the new challenge of the dramatic growth in urban population – a doubling of the city population in Asia and Africa – another example might be of interest. 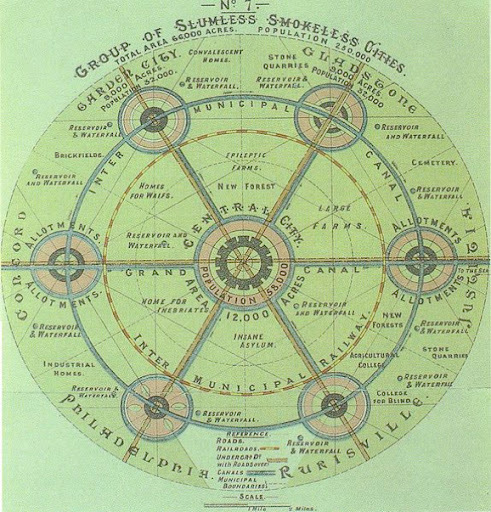 Thinking back to the last urban crisis this latest and now upcoming reaction very much reminds me of Haussmann’s renovation of in Paris or Ebenezer Howard with the Garden City.In fact both came after the Cholera pandemics. I am pretty sure, actually I was only waiting for the first such news to appear, that we ill see a lot of reactions to the ‘city problem’ coming down a similar route as the article quoted in the beginning of this post. It is all bad and we have to reinvent to solve it. Urban designer will be very quick to jump to Howard’s idea of the Garden City to have a readymade solution. Someone will dig it out. However to make it clear, I am not playing down the urgent and extend of the raising question. In the contrary, it is an urgent matter, especially because the urban planning profession in general and urban design and architecture (I add them here because they all think they can do both anyway) in particular is in an identity crisis with no consistent concepts available at present. The only thing that buzzes around is sustainability, but it’s got no content to it. In an article on io9 Chanda Phelan presents how apocalyptic stories have changed in the past 200 years. She explains ”It’s not the idea of Ending itself that has faded – that will be around until we are actually mopped off the face of the Earth. It’s the actual moment of disaster, the blood and guts and fire, that has been losing ground in stories of the End. Post-apocalyptic fiction is a 200-year-old trend, and for 170 of those years, the ways writers imagined the end were pretty transparently a reflection of whatever was going on around them – nuclear war, environmental concerns, etc. In the mid-1990s, though, everything just turned into a big muddle. Suddenly, we’d get a post-apocalyptic world whose demise was never explained. It was just a big question mark.“ And she also points out that actually it was never about the end, but the new beginning. However she analyses that in the last 30 years there has been a decreasing interest in the why and how of the end, very often simply assuming that there was an end. Presumable, from my reading of it, the apocalypse was never about, it actually ends, but about narrating a sin or something stylised ‘problematic’ to actually urge people to change something in the present. Implying ”if you don’t behave now, something disastrous might, could possibly, eventually, maybe happen“. And in this sense skipping this part of the apocalypse is indeed a very dramatic change. In this sense the attitude to the posed urban growth question would be, let’s skip the growth, the infrastructure demand, logistics, flows, identity, morphology, material, organisation, atmosphere, form, transport, colour, work, resource, governing, social, knowledge, communication, finance, and so on question and just build a New Cities for some 80 million people or maybe better a set of Garden cities, each with some 58’246.1 residents ?